First of all I would like to thank Police department & You for your valuable service in Coimbatore. I am a 21 yrs old call center employee Residing at Coimbatore. It was my long time wish that I should join in a rifle club, But I do not know the procedures. Request you to help me out on the same. yesterday, i opened a rifle shooting range in singanallur. you may join there too. it is a school, SSVM global school. I am Aravindh Vjayendran lives in Coimbatore doing my MBA now.. i am A big fan of you... and i would like to See you sir, and like to spend a bit of time with you in your busy time. i kindly request you to give me an appointment to meet you sir. 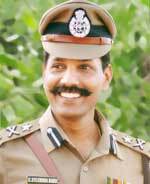 for your reference my dad N.VIJAYENDRAN is aslo a Sub -Inspector of POLICE Coimbatore. i dono how to explain the humanity u have showed here sir. am Really Stunned with the usage of words and proud of you. i pray to god that the service be done by you will continue for ever. Does it really need a rifle club membership . Because when I was in USA I have one that I used for target practicing.